Mary Samuelson told a scammer to scram, but not before he punched two holes in her car. A brazen con man is on the loose in south city, victims say. Mary Samuelson, owner of the popular Shaw restaurant Mama Josephine’s, first learned of him in early December when he tried to hustle her for a wad of cash. 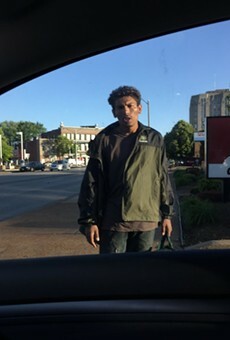 She was parked outside of Ruler Foods on South Grand Avenue and figured the guy for a swindler as soon as she saw him coming toward her window. He’d want money, she knew. He’d have a story. The man claimed he worked for an auto body shop and said he could fix a small dent on the back of her Toyota Corolla. Samuelson wasn’t interested, but she offered to take a business card and think about taking her car in for an estimate. “I was trying to be polite,” Samuelson recalls. But the guy was quick. Within seconds, he was wiping a paste over the Corolla’s roof and rear quarter panel, claiming it would erase some scratches. He then pulled a screwdriver and hammer out of a flowered tote bag, took aim at the golf ball-size dent below Samuelson’s taillight and gave it a whack. Before she could stop him, he’d punched a second, small hole next to the first, chipping off the paint as he worked. Samuelson says she yelled at the man as he wiped more paste over the mess. But he insisted he was fixing the dent — and was now owed $95 for his efforts. 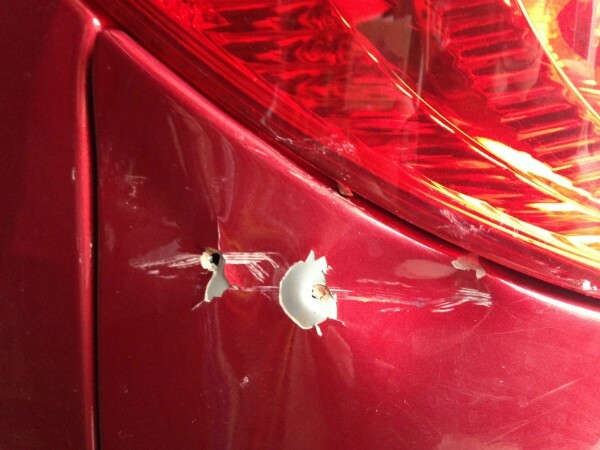 A con man used a screwdriver and hammer to punch two holes below the taillight to 'fix' a dent. “You had better be glad I’m in a big hurry right now or I would call the police and have you arrested,” Samuelson told him and drove off. She did call police and gave them a description. The man was slim, maybe 5 feet 8 inches tall with olive-colored skin, curly dark hair and a slight accent she couldn’t place. Samuelson estimates he was 30 years old at most. Officers went looking for the man, but he’d already fled the parking lot, according to the incident report. There have been no arrests in the case, a police spokeswoman told the Riverfront Times. And when Samuelson began warning her neighbors. she learned that more than a dozen had similar stories about the shady parking lot shyster. The scam is an old one. Variations are practiced by chiselers across the country. Baltimore news stations were warning viewers in 2013 about con artists working grocery store parking lots. Denver’s district attorney put out a news release the same year to alert Coloradans about faux body shop hucksters. People in Seattle, Houston and Chicago have all fallen victim to the ruse. If Samuelson had let the man continue, he likely would have pushed forward with a familiar script, with the full hoax circling back to the paste. Fraudsters tell their marks to let it “cure” for four, five, sometimes 24 hours and then buff it out to reveal a like-new finish. Some even hand out numbers and tell their victims to call so they can come back and finish it for them. By the time people realize they’ve been had, their friendly repairman is long gone. The phone number they left? Bogus. 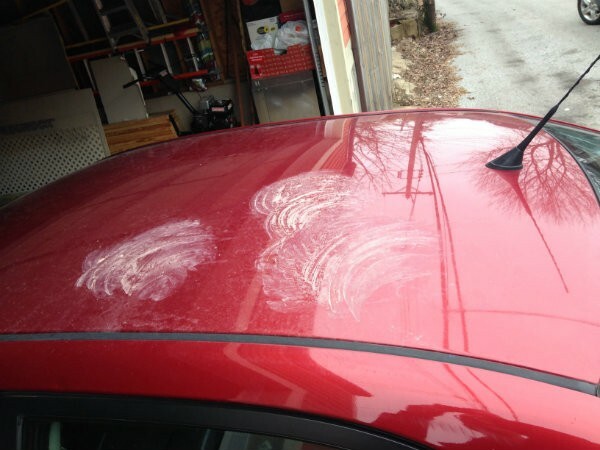 The paste a scam artist rubbed on the roof of the Toyota Corolla remains as a reminder of the quick-working con man. Samuelson at least didn’t part with any money, but she now has a pair of holes in her car to go with the dent that hadn't even bothered her before. She leaves the paste smeared across the roof and door. “It reminds me not to be so nice,” she says.